The forecasting role and forecasting tools as part of a corporate business function, or as part of a commercial consulting project in Pharma, Biotech and Medical Device organisations, continue to evolve. Erik Holzinger (groupH) together with Ben Collins (Boehringer Ingelheim) hosted a round-table discussion during this year’s annual EphMRA 2018 Conference in Basel, during June 26 – 28, to open up a number of key topics to a wider audience, share views and come to a consensus on current best practice. The group consisted of some very experienced individuals from a broad range of pharma companies and business functions, as well as several people from the agency side, providing for diverse backgrounds and insights into what one individual named “…a very big subject”. How to communicate strategic forecasts and illustrate uncertainties to senior management – does Monte Carlo simulation have a role here? Required granularity and scope in forecasting strategic pipeline and in-licensing assets: US + RoW? EphMRA is planning a Forecasting Roundtable No. 2 at our 2019 meeting in Warsaw. Please send any comments you might have on this year’s roundtable and potential ideas for topics to be discussed at future round tables to erik.holzinger@grouph.com. We want to hear from you! The importance of planning market access strategies at an early stage. There is an ever-increasing influence of payers in treatment decision-making processes. The commercial success of new pharmaceutical agents will therefore be heavily dependent on their market access position. In the past it was the norm to engage with regulators at an early stage of drug development, but leave payer discussion to much later on in the process. Now though, it is becoming critical to evaluate the market access position of early-stage candidates right from the outset – the objectives being to reduce the overall go-to-market risk, achieve significant savings, and increase speed and magnitude of return on development dollars. One should never forget that any product that is denied reimbursement or provided only limited coverage is a product that has been approved by regulatory authorities. This illustrates the different perception of value across various stakeholders. However, few drug-developers or investors are as yet dealing with payer value uncertainty in their clinical development plans and commercial strategies from this early stage. How to tackle payer value uncertainty. Can the product increase survival? Can it increase patient quality of life? Can it reduce health resource utilization? Nicolas Touchot, who heads up groupH’s newly formed Market Access practice, brings his insights from working with payers over many years to the task. With Nicolas’s expertise to enhance groupH’s offerings, we can help enable our customers to develop and refine their market access strategies and integrate these considerations into key product and therapeutic area decisions along the full pharma value chain: from allocation of R&D resources to product life cycle management. For instance, we can help integrate market access considerations into Opportunity Assessments. Target product profiles, even at early stage, should include well-defined Payer Value Elements (PVEs). GroupH can aid in the identification of theoretical PVEs (clinical and/or economical), help express those PVEs compared to expected standard of care at launch, and identify approaches for demonstration of these PVEs. We believe we achieve more from our payer work than other organisations, because only experienced and dedicated market access experts interact with carefully selected senior payers. Also, our payers can rely on comprehensive and detailed briefing materials prior to a discussion, which greatly enhances their ability to make meaningful comments in particular in orphan and other rarer indications. All this of course, is complemented by our proven track record in in-depth primary KOL and secondary research. As an easy first step, Nicolas has developed a simple scoring system based on the four key questions above, answered by payers across many geographies with disparate health care systems. This provides a global view and allows characterization of the market access potential of early-stage assets. 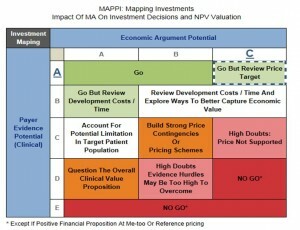 The algorithm, known as MAPPI (Market Access Potential and Pricing Index) has been validated by investors and research executives. Results are then combined through a series of scores and matrixes to define a market access environment score and to evaluate the impact on investment decisions and modelling assumptions. Get in touch for more information on how groupH can help. Nicolas has addressed many other issues facing the industry with respect to market access in articles he has written recently (see below for details). He is also very happy to provide additional information and support, so please feel free to drop him a line! Maximizing the Value of Early Engagement Between Manufacturers, Payers and Regulators in Europe – Key Lessons Learned From TCA’s Experience. TCA Viewpoints. November 2013. Projecting Market Access Success For Early-Stage Pharma Assets: Getting Past The Hurdles. Nicolas Touchot, Lynn Nishida, Mathias Flume. In Vivo. February 2013. Pharma strategies for development of payor evidence programs. Marie Cassese and Nicolas Touchot. In Vivo. February 2012. The New Role of Payer Advisory Boards in Shaping Clinical Development Preparation, Structure, Outcomes and Key Success Factors. TCA Viewpoints. February 2012. Integrating payor requirements into phase III clinical trials. Nicolas Touchot and Marie Cassese. In Vivo. June 2011.